It’s my first Christmas! I have no idea what this means, but Mommy keeps dressing me up in “festive” (a.k.a. Uncomfortable) outfits and taking endless photos of me. She also keeps chasing me and my fur siblings away from “decorations” and “presents”. These items are obviously made for the enjoyment of kittens and babies, what with their sparkles, flashy colours and lights, jingly bells, and scrunchy paper. What child or feline could resist a little chomp here or there? Mommy keeps playing different versions of the same songs over and over. I would approve of Raffi song covers on repeat, but this is craziness. I may need to stuff my monkey blankie in my ears if I have to listen to one more version of that song about the baby Jesus and how he never cried in the manger… come on buddy, you’re making the rest of us babies look bad. I keep seeing images of the same creepy old bearded man dressed in red. He’s on every floor of our house. He’s in the grocery store. He’s in some of the books that Mommy reads to me. It’s like he’s always watching… as though he knows when I’m sleeping, and perhaps when I’m awake. Well, better up the ante on the refusal to sleep through the night so that I can keep an eye on HIM. Take that, old man. How do YOU like being judged? I love to look out the window at the sparkly lights twinkling on the porch, but it seems like as soon as they appear against the darkening night sky, Mommy is scooping me up and trying to force me to lie down in that demeaning cage they refer to as a “crib”. Harrumph. What do Mommy and Daddy actually do when I finally surrender to sleep? I bet they are downstairs right now, dancing under the sparkly lights, playing with the colourful decorations and unwrapping crinkly papered presents, listening to Raffi!! Ahahahaha!!! I love this post! Made me laugh! Creepy bearded guy lol! What an adorable photo of your baby! 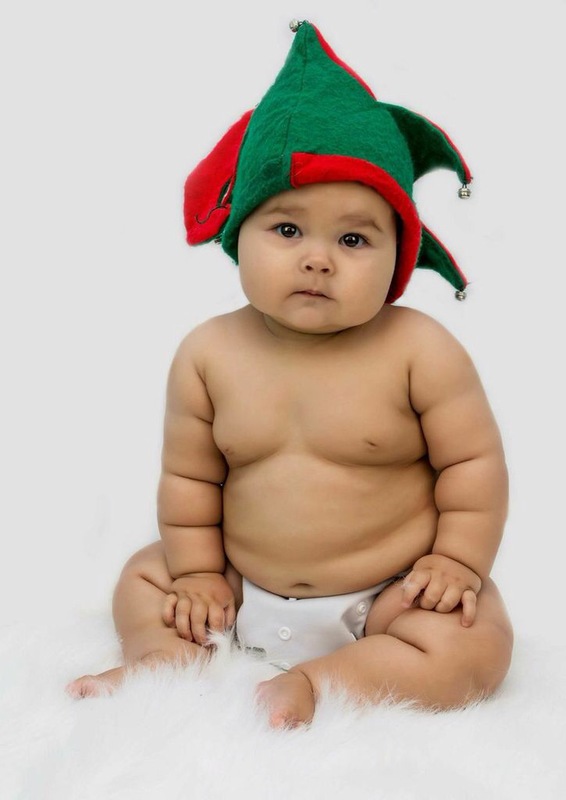 Reminds me of how squishy my chunky monkey was last year. She’s 16 months old now and losing many of her cute rolls, haha! This is exactly how some adults feel, Kimiko. Except Willow misjudged the parents. When she is asleep, they are not dancing under lights. They are crashed on the couch, trying to renew their energy.